Over the years we have reviewed a large number of standby savers – devices designed to cut the power to devices in standby to save energy and money. In this article we will review the Savasocket 6 Gang standby saver. Pictured above the the Savasocket 6. While looking similar to a standard extension lead, it actually offers a lot more. The six sockets are divided into two sections: two on the ALWAYS ON side, and four on the SAVER SIDE. Appliances which need to permanently connected to the power (e.g. those which have a clock) get plugged into the ALWAYS ON sockets, and those which are to be turned off rather than left in standby plugged into the SAVER SIDE. What makes this standby saver different from many others on the market is that it can be controlled using any standard infrared remote control. A small infrared detector (the infra red eye) is attached to the Savasocket by a 2 metre lead so that the Savasocket itself can be put out of view. The Savasocket has to be taught to recognise your remote control. The button on the Savasocket unit is pressed for 5 seconds to enter learning mode. Then you just have to press your choice of button from your choice of remote control and direct it at the infrared eye to complete the learning process. (It is recommended that you use the standby button of the TV remote control to control the Savasocket.) Now the Savasocket will recognise the infrared signal from that button on that remote control, and will cut the power to anything plugged into the SAVER SIDE when it is pressed. Pressing the same button again later turns everything back on. The Savasocket offers soft shutdown which is very important when using the latest flat screen televisions (and other products) which do not take well to be turned off quickly. The Savasocket also offers full surge protection to protect sensitive electronics from damage when there are spikes in the voltage supply. It also has very low electricity consumption itself coming in at under 0.20 Watts when in standby mode (measured using a plug in power meter). Of the many standby savers and similar products we have tested, this is by far the best. It is very very simple to set up and use, and it is well made. The instructions are clear, well illustrated and easily understood. It is no uglier than the other products on the market, and thanks to the long lead on the infrared eye, the Savasocket can be position well out of view – for example behind the television. 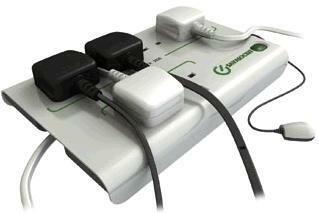 The soft shutdown works well which will help to extend the life of any devices plugged into it. Finally, Savasocket is also very competitively priced at under £20 – a bargain since it will pay for itself in under one year. The Savasocket 6 is available directly from the Savasocket website. At this same site the Savasocket user manual (PDF) is also available to download.